Can I make my bracelet smaller? Click the picture to learn how to make your bracelet smaller. Can I make my necklace shorter? Yes, just open up the clasp & cut the excess chain with wire cutter or scissors. Whether you want to start a spirit store for your organization or a fundraiser, click here for more info! How can i make my bracelet smaller? Click HERE for a video tutorial on how to make your bracelet smaller. can i make my necklace smaller? ​WHAT IF I WANT CHARMS NOT OFFERED ON YOUR WEBSITE? 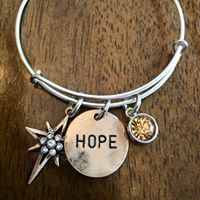 Gayle Winn Designs has more than 650 different charms in stock including colored gems, sports, activities, music, inspirational sayings, faith & so many more! We can't post them all as stock changes so frequently so we encourage you to ASK ASK ASK if we have what you are lookng for! Just send us a note through the CONTACT page or email gaylewinndesigns1@gmail.com. will gayle winn designs be at any events? ​Gayle Winn Designs does a handful of events a year in the Chicagoland area. Click HERE for a list of our upcoming events. We usually bring all 650+ charm options to choose from & orders are made on-site. what types of organizations have group shops? ours isn't very large. Group shops are ideal for groups who are looking to offer jewelry tailor made for their organization & passions! Whether you are a charity, sports club, school organization, church group or more, we can help! It just takes $25 to set up the shop & if you want to use a logo on a charm approval from an authorized authority. You don't need to be a huge organization to offer a shop. We cater to all sizes of groups, with the average minimum of 25 members. I want a group order but not a group shop. is that okay? Yes! We can help you! Just CONTACT us & let us know what you would like to do. We are very accommodating! ​IF WE HAVE A GROUP SHOP, DOES IT HAVE TO BE A FUNDRAISER AS WELL? how do i set up a group shop for my organization? Contact Us & tell us about your organization & what types of charms you may be interested in having. Pay the $25 Set Up Fee. If you want to offer a charm with your organizations logo, send us approval to use the logo from the appropriate authorities. We will build your shop & send you the link to it. Gayle Winn Designs will ship orders directly to customers. DO I NEED TO USE AN ORGANIZATIONAL LOGO IF I SET UP A SHOP OR FUNDRAISER? No. We have over 650 charms to choose from including colored gems, sports, activities, music, inspirational sayings, faith & so many more! We can offer a variety of options to make it personal & extra special for your members! Can i host a home show or on-site organization show? If you live in the Chicago area, yes! Gayle Winn Designs will bring ALL 650+ Charms to you! For two hours, we will help your group design personal & meaningful pieces & make them on-site so they can be taken home that day!We ask that you have at least 12-15 in attendance for your event. For more info click here: HOST PARTY. CAN I HOST AN ONLINE SHOPPING SHOW? WHAT IS THE DIFFERENCE BETWEEN A GROUP SHOP & JUST SENDING OUT A pARTY CODE? Good question. Group shops are for larger groups/organizations, who want to offer more specialized offerings to their people & make it easy for them to shop. For example, if it is a synchronized skating team, we can offer not only their clubs logo (with approval), team colors & skating charms... we can offer special charms that related to the seasons theme, choreorgraphy & perhaps even team mantras. You can also parlay it into a fundraiser & sales from not only the Group store, but throughout the site will count towards the fundraiser. A Party Code a way for anyone to HOST AN ONLINE SHOPPING PARTY.. 15% of proceeds of sales from throughout the site will go to the person who set up the Party Code (as long as the Party Code is entered into the notes section of each product bought). Click here for more info: Start a Group Shop. Host a Party. what is your jewelry made out of? Our bracelets are silver plated. The charms vary- some silver plated, some pewter. If you have a nickle allergy, we suggest you refrain from wearing our jewelry. can you make a charm out of a picture or SIGNATURE? Yes! We have done many charms memorializing family members with photos or handwriting & photos of beloved pets. A 1-3 word handwriting sample works best. You can send us a photo or photo of handwriting & we will do our best to make you something special. Contact us to get started.